Palm Spring, in other name called Palm Spring Condominium, refers to a high-density residential property situated at Kota Damansara. The developer of this project, Muafakat Kekal, deals with property investment in addition to project development. The Kuala Lumpur-based company was incorporated in 1995. This condominium has six block housing 2,180 units in total. Palm Spring offers a wide range of amenities to its occupants including swimming pools, wading pool gym, Jacuzzi, nursery and much more as you’re going to see here later on. Its residents rest assured of peaceful stay in the condo because of the presence of 24-hour security. Life in this property is full of conveniences due to the strategic location which enhances the accessibility of the residential development as well as making various amenities in its neighborhood easily accessible to its residents. Life in Palm Spring is one of its own kind and that explains the reason you shouldn’t miss an opportunity to be counted as one of the owners of its units. If you are a swimmer, a whopping seven swimming pools are at your disposal so that you can enjoy doing that which you love right from the comfort of your doorstep. In addition to the swimming pools, the property offers you other recreational facilities including a gymnasium, tennis court, in-house badminton court, golf-putting ground, a wading and a playground pool for kids. All these facilities are properly maintained hence making the property more valuable. With these facilities, you and your family will be able to enjoy your leisure time from the comfort of your home. Additionally, the property has a Jacuzzi and sauna for ultimate relaxation after long-days hassles. Don’t shy away from investing in Palm Spring due to possible uncertainties you may have concerning security since it boasts 24-hour security complemented with card access system. Palm Spring boasts a rapid and remarkable value appreciation. 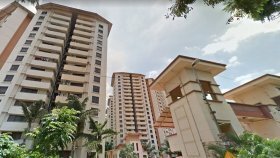 A unit with a built-up size of 936 square feet was being sold at RM260,000 in 2011, while a year later, the price of a similar unit was RM330,000. The property is expected to appreciate even faster once the construction of MRT station in the area is complete. Palm Spring can be accessed through Jalan Damansara, NKVE, Lebuhraya Damansara-Puchong Highway as well as Penchala Link. The vicinity of this property hosts a wide range of public amenities. In fact, the city centre of Kuala Lumpur is located roughly 15 to 30 minutes away from the project through Penchala Link. Various shopping options such as The Curve, AEON BiG Hypermarket, IKANO Power Centre, 1 Utama Shopping mall, eCurve, IKEA as well as Tesco Extra hypermarket, among others are just stone throw’s distance away from Palm Spring. Parents who live here enjoy the convenience of taking their children to various schools which are very near to the residence. They include Kidzania, SK Seksyen 11 Kota Damansara, SMK Seksyen 4 Kota Damansara and SJK Effingham. Institutions of higher learning in the neighborhood comprise of SEGi University College, KBU International College as well as Wawasan Open University. There are also hotels such as One World Hotel as well as The Royale Bintang Damansara within the vicinity. Health facilities in the neighborhood include Klinik Pergigian Haniza, Alpha Hand Surgery Centre, Alpha Specialist Centre, Klinik Alam Medic, Klinik Wong Singh, among others. 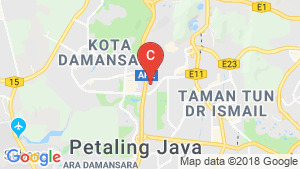 Nearby attractions include Mutiara Damansara Recreational Park, The Club Bukit Utama, Bandar Utama Golf Driving Range as well as Kelab Golf Sri Selangor. Palm Spring hosts a variety of amenities for ultimate condo living. The amenities include seven swimming pools, wading pool for children, sauna, in-house badminton, clubhouse, gym, sauna, tennis court, nursery school, playground for kids, mini market, car part with multiple levels and a golf-putting ground. The project is also equipped with 24-hour security complemented with a smart card access control system. Palm Spring Condominium has six blocks housing 2,180 units in total. The units feature different layouts, with their built-up sizes ranging from 915 square feet to 1,259 square feet. All the blocks feature a U-shape design. The project was completed in 2005 and the launch sale price of its units started from RM160,000. Other residential property in the locality of Palm Spring comprises of Verde @Ara Damansara, The Loft @ZetaPark, Suria Residence @Bandar Mahkota Cheras, East Bay Luxury Apartment, and Mahkota Garden Residence Condominium. Palm Spring is a condo project developed by Palm Spring, Palm Spring construction was completed in 2005. and contains 2180 total units, Units range from 3 bedroom to 3 bedroom. Palm Spring at Petaling, Selangor has the following facilities: bbq area, cctv, fitness, garden, parking, playground, security, swimming pool and tennis. There are 1 condos for rent in Palm Spring available from RM1,500 (based on 1 year rental term). 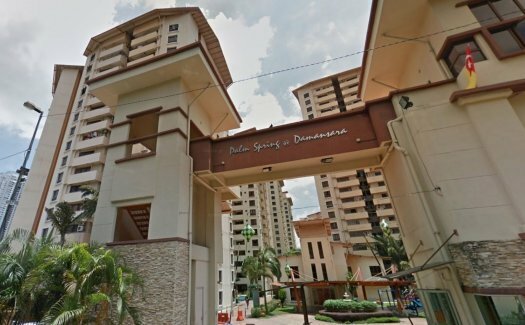 FF & NICE PALM SPRING CONDOMINIUM, KOTA DAMANSARA FOR RENT.